In many cases ITSM Availability Management Process is overlooked due to other frontline processes such as incident, problem and change management. I have provided a summary of this availability management process and significance below. I hope that the information is useful for your organisation in order to define and implement the process. Availability management has to ensure that the delivered availability levels for all services comply with or exceed the agreed requirements in a cost-effective way and enables the business to satisfy its objectives. Create and maintain a forward looking Availability Plan aimed at improving the overall Availability of IT Services and Infrastructure components to ensure existing and future business Availability requirements can be satisfied. Designing, implementing, measuring, managing and improving IT services and the components that are used to provide them. Availability management is part of service design and it is one of the critical process because the reliability of a service or component indicates how long it can perform its agreed function without interruption. 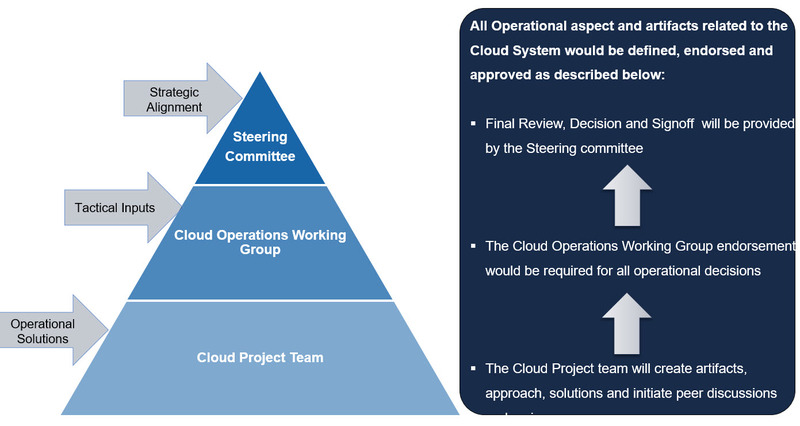 Cloud operations stream is responsible for designing and operation of the cloud model for the project and BAU activities. This stream is primarily responsible for people, process, tools and information. The model can change as the organisation’s requirements and type of business. 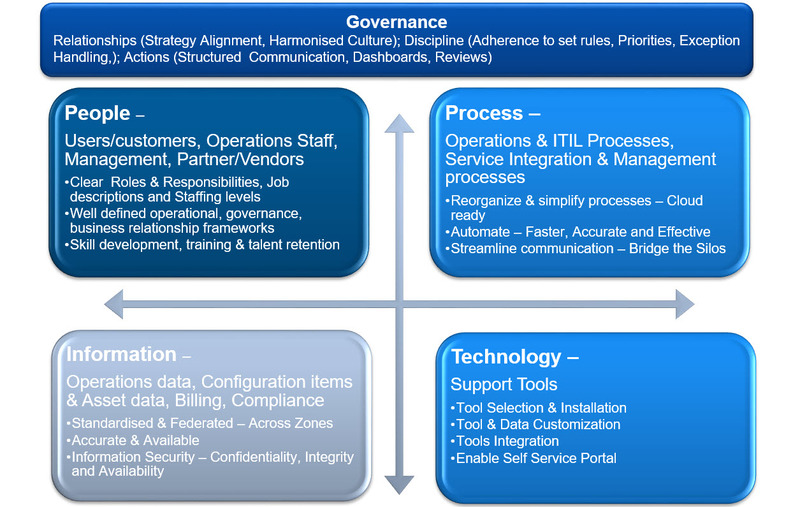 Below is an example of key aspects that we need to consider when defining Cloud Operations Model. 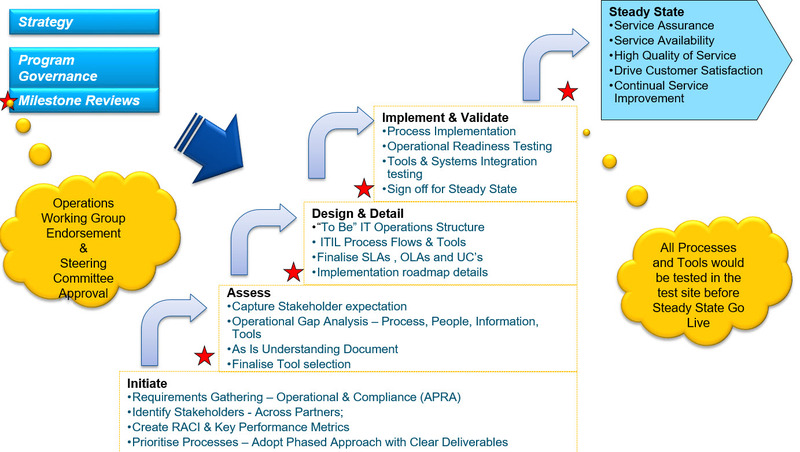 Below is an example model for how to track a cloud program operationally. Below is an example model for cloud operations stream governance, which can be used to guide the operations stream. 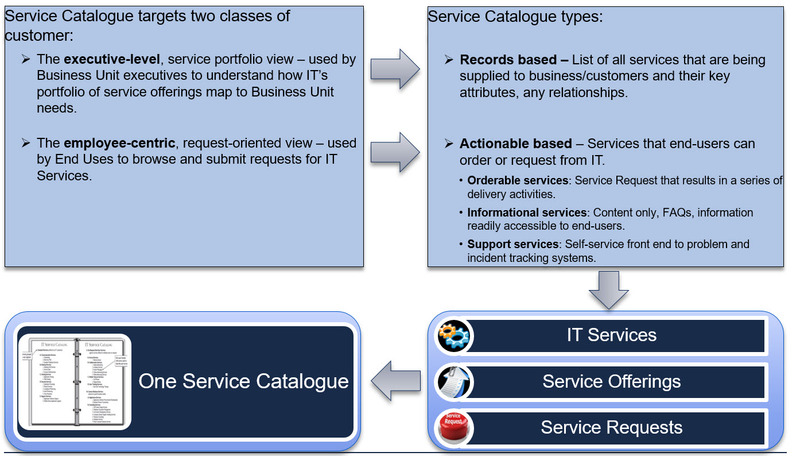 The Service Catalogue represents a trusted record of the services provided by Information Technology (IT), its default capabilities, measures and primary means of access and provision. It is the means by which we articulate WHAT we manage and measure. It is the hidden power of how we set the customer’s expectations and exceed them. It can provide an essential medium for communication and coordination among IT and its customers, and should distinguish between Business Customers (the ones paying for the service) and End Users (the recipient of the service). If CMDB is the system of record for what IT did, then the Service Catalogue becomes the system of records for what IT does. 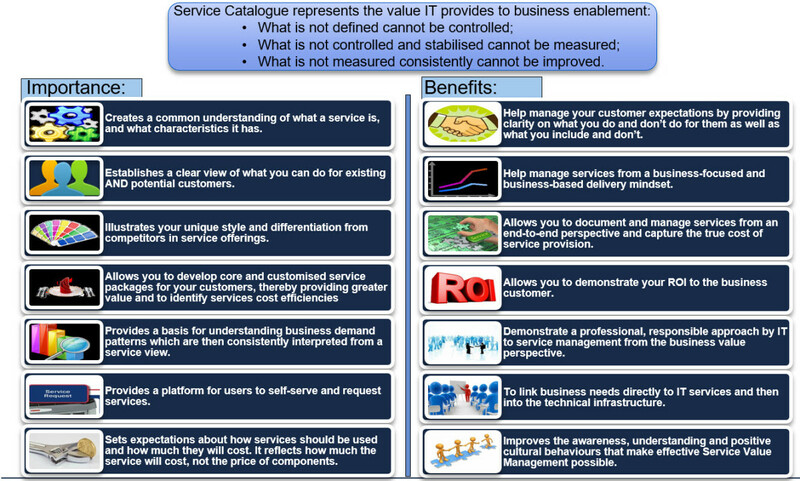 ITIL recommends the development of a Service Catalogue as the first step in the Service Level Management (SEM) process. Why Service Catalogue is Required? For IT to be fully successful, IT needs to be strategically aligned to the business and positioned as a key enabler in achieving successful outcomes for the organisation. It is not enough for IT alone to consider itself successful at what it does. IT needs to provide real value to the organisation that directly achieves business outcomes that the organisation wants to achieve and should be able to deal with the ever changing needs and demands of the organisations and their customers. IT should also be capable of demonstrating how it provides business value to the organisation to ensure that IT is positioned within the organisation as a core strategic asset. To support the above, it will be good for IT to develop a Service Catalogue that defines the scope, characteristics and costs of available services and products, and allows for better management of the IT environment as a whole. The basic requirement to do all this is to have a clear definition of the services the IT organisation provides, the components and resources that make up the service, and the associated costs for these services. 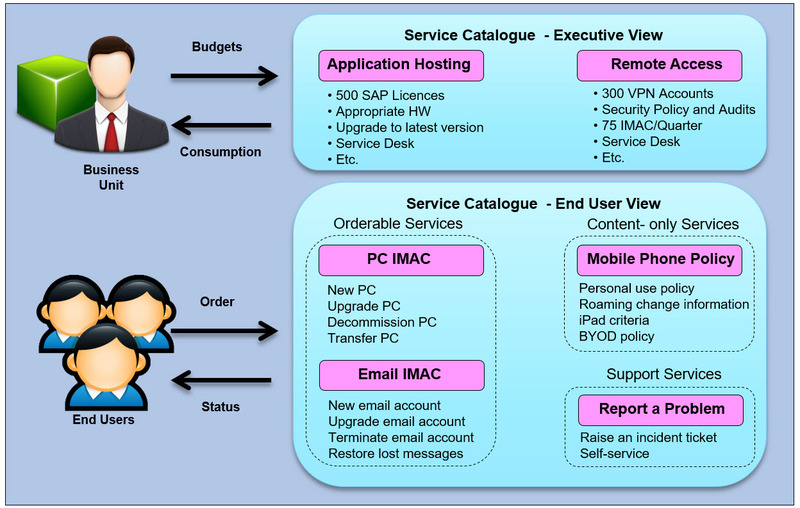 Why Service Catalogue is Important? 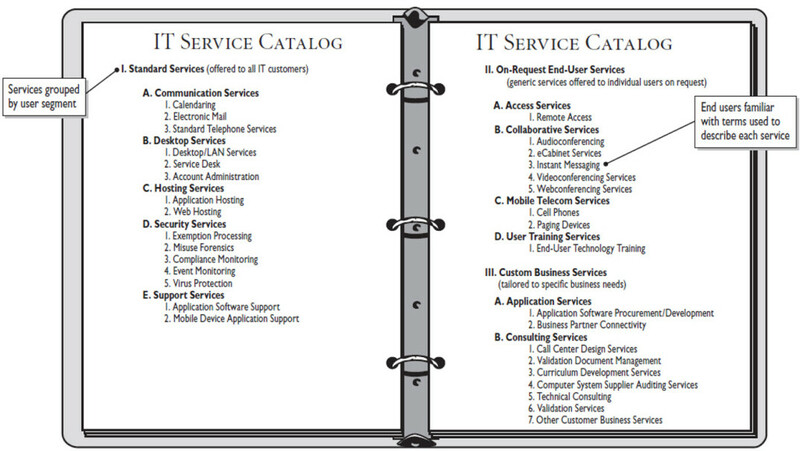 The two types of Service Catalogues are records based and actionable based. Constitutive – what IT does and does not, and on what terms. Actionable – provides the means by which IT and its customers coordinate and conduct business. 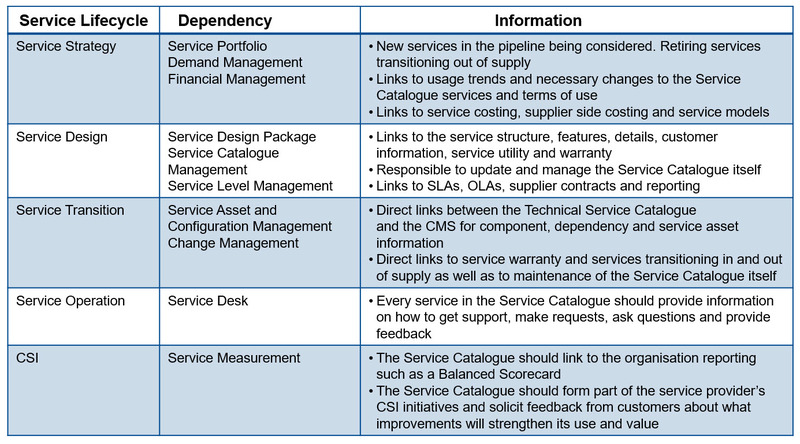 Governing – conditions and controls defined in the Service Catalogue are integrated into the service delivery processes. Service Catalogue can be a simple list in Word or Excel document, or as comprehensive as installing specific tools designed to create formal Service Catalogues. One question all organisations should be asking themselves is what happens to traditional managed services models once we shift towards cloud computing? In the past, managed service providers would tell you why, what and how they deliver service management so it will provide value to your organisation. The end result would likely be a fixed term service management model. Technology has always been a fast-pace landscape which has made the delivery of long term value to customers out of service management agreements challenging. If you thought it was already fast, cloud computing has put the accelerator to the floor! All of which means the way service management models handle change has to go on a transformative journey as well. ITIL defines Service Management as “a set of specialised organisational capabilities for providing value to customers in the form of services”. Key to answering these questions are people and the way that they provide value. The managed service provider will intermediate between the cloud service provider and consumer, aligning the two and ensuring minimal service disruptions. So how does this change the traditional methods of service management for an organisation? Let me introduce consumption-based service management (to be fair, it’s not a new concept but a model that will potentially redefine the way services are being delivered). In this model the consumer pays for the value that you as the managed service provider will deliver on a consumption, rather than a fixed, basis. As more and more organisations recognise the importance of the cloud, they have a ‘light bulb’ moment. They come to realise that they only need pay for the said light bulb when it’s on. Also, typically the switch used to turn it on or off is included in this cost. The obvious follow on is to ask why should managing cloud environments not align with the way that the cloud is being consumed? Hence we arrive at a model based on consumption service management. So what does this mean for the day to day operations of a managed services model? The customer will cover the cost of the cloud provider and the supplier managing the service, ensuring the technology is being effectively managed, but to our metaphor above, why should they cover this when the lights are off? It’s here where we find value of consumption-based service management. 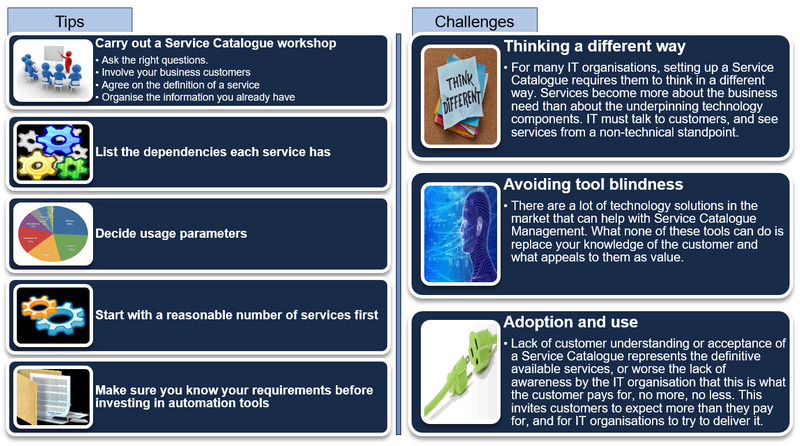 If the customer needs service management all the time, then you have to begin to wonder why? What are the changes one needs to put into place to remediate? This change in model will surely flip everything upside down. How we measure service consumption in this case? Is there a different way of measuring value? What impact that would have on the traditional measurements and costs associated? Regardless of the above, the central goal to this consumption-based model will still be value, which will continue to drive conversations and delivered outcomes. When you sit down to reflect or dream at what managed services for your organisation will look like in the cloud you should think about consumption-based service management and delivery thereof.